We are destroying our natural environment at a constantly increasing pace, and in so doing undermining the preconditions of our own existence. Why is this so? 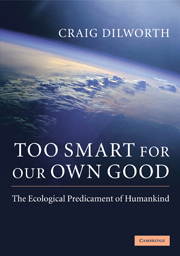 This book reveals that our ecologically disruptive behaviour is in fact rooted in our very nature as a species. Drawing on evolution theory, biology, anthropology, archaeology, economics, environmental science and history, this book explains the ecological predicament of humankind by placing it in the context of the first scientific theory of our species' development, taking over where Darwin left off. The theory presented is applied in detail to the whole of our seven-million-year history. Due to its comprehensiveness, and in part thanks to its extensive glossary and index, this book can function as a compact encyclopædia covering the whole development of Homo sapiens. It would also suit a variety of courses in the life and social sciences. Most importantly, Too Smart for our Own Good makes evident the very core of the paradigm to which our species must shift if it is to survive. Anyone concerned about the future of humankind should read this groundbreaking work. Preface; Introduction; 1. Scientific ground rules; 2. The new views in anthropology, archaeology and economics; 3. Theoretical background to the vicious circle principle; 4. The vicious circle principle of the development of humankind; 5. The development of humankind; 6. The vicious circle today; 7. … and too dumb to change; Conclusion; Glossary; Notes; References; Index.